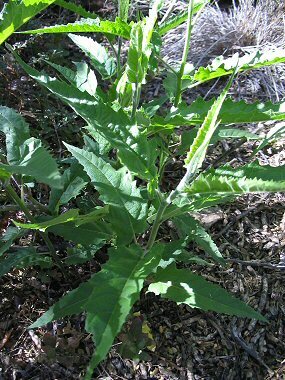 Canyon Ragweed is a member of the Sunflower Family. It grows to 40 inches in height and has green, triangular leaves with saw-toothed edges which grow to 5 inches in length and 1 inch in width. The plant typically grows in sandy washes and canyons at elevations below 4500 feet. Many people are allergic to Ragweed pollen, which the plant produces in large quantities. Canyon Ragweed typically blooms between February - May and produces clusters of yellowish green flowers to 3/8 inches in width which grow on a terminal spike. 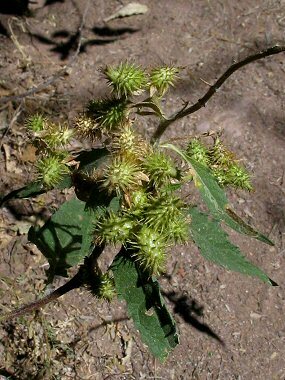 Flowers are followed by a burr-like fruit which grows to 1 inch in length with slender spines that sticks to fur and clothing.